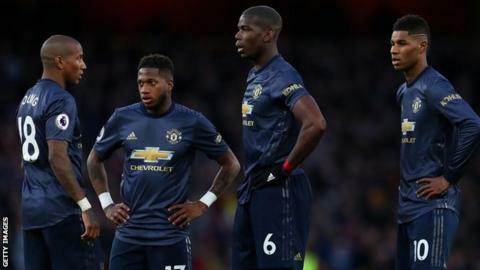 Manchester United's first Premier League loss under Ole Gunnar Solskjaer is the "lowest" moment since he took charge, the interim manager said. Solskjaer has turned the team's form around since taking over in December, following the sacking of Jose Mourinho. Solskjaer told BBC Sport: "The performance was good but the result was disappointing." "When you see the boys work as hard as they do, the attitude they show in training - today we were lethargic in the first 10-15 minutes, did not have the zip and we did not take the chances. Hopefully we will be ready for Wolves in the FA Cup next week. "It has been fantastic so far but today is the the lowest we have been because we lost and missed the chance to put pressure on Spurs. Emery told BBC Sport: "I am very proud of our players. They gave all they could against the best team at this moment.